1. When and where can I pick up my Anthem LemonAid kit? 2. 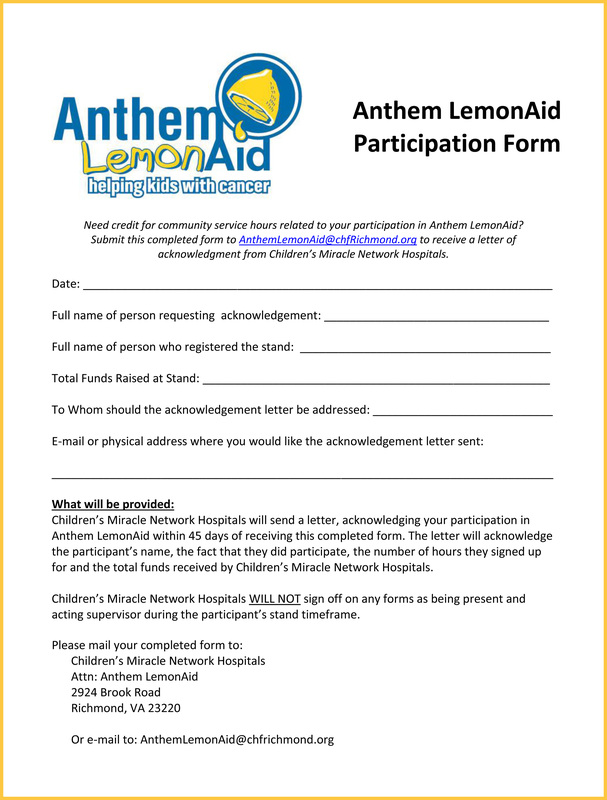 What comes in my Anthem LemonAid kit? Lemonade mix, cups, a pitcher, stickers, a banner and sunglasses. Please remember that an actual stand is not provided. 3. Where should I set up my stand? Anthem LemonAid's available Walmart, Sam's Club, Kroger, Walgreens and Lakeside Avenue locations are great options. Check the registration page for individual store availability. Swimming pools, baseball fields, grocery stores, yard sales, local businesses and your neighborhood or front yard are all great locations too. 4. After LemonAid weekend is over, how do I turn in my money? Please mail your check or money order for the amount raised to the address below. You can also pay by credit card by calling the Children's Miracle Network Hospitals' office at 804-228-5934. If you do need to turn in cash, there will be one opportunity for you to do so at the hospital's 2924 Brook Road campus on Tuesday, July 18th from 10am-2pm. Cash can not be accepted at any other time. Anthem LemonAid has been proud to support the Hematology and Oncology Clinic at Children’s Hospital of Richmond at VCU since it began. In 2016, that partnership was taken to new heights with a two-year $250,000 commitment to support the Clinic’s Infusion Center. The Infusion Center, housed in CHoR’s new Children’s Pavilion, is where children with cancer can receive the chemotherapy, blood transfusions and immune system boosting infusions they need. 100% of funds raised in 2017 will continue to support this goal. 6. How do I create a fundraising page? Click HERE and follow the steps to register your LemonAid fundraising page. The easy step-by-step process will walk you through registration and provide you with a link to your own personal fundraising page. All you need is your computer, a goal and a few e-mail addresses of family and friends. 7. What happens if it is raining during my stand shift? Anthem LemonAid occurs rain or shine. However, please use your best judgement if there are poor weather conditions. Please go indoors if there is a thunderstorm. 8. What do I do with my extra kit supplies? As a safety measure, unopened and unused kit supplies can not be accepted. Please save any extra kit supplies to use at your stand next year. 9. Can you help me receive volunteer hours for school? Although one of our staff members can not sign off as acting supervisor, we will happily provide you with a post-event letter confirming your stand participation and total funds raised. Submit this request form and an acknowledgement letter will be sent to you within 45 days. 10. What if I need to cancel my stand? 11. What if I can not host a stand during the specified date? Although we prefer to have all stands hosted the weekend of July 14-16, if you are unavailable that weekend but would still like to host a stand, please call Amy Dickstein at 804.228.5934 to make arrangements.